Need pallet jacks, rolling ladders, maintenance cages, carts, levelers, dollies, etc.? Let The Surplus Warehouse, help make sourcing easier for all of your industrial material handling equipment needs. As one of the largest material handling dealers in Philadelphia, Pennsylvania, our facility is ready to help you with many used and new material handling lines in stock. If we don’t have it in our used inventory, we can get it for you from one of the many new manufacturers that we represent. Contact us with any questions you may have regarding our customer service or our industrial material handling equipment. 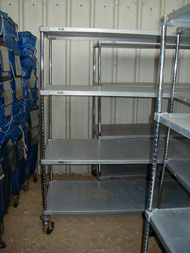 Want to know about the latest specials on new and second hand used pallet racking systems? Click here to join The Surplus Warehouse mailing list to receive our periodic newsletters. This is one way to keep your business in the loop on promotions and new inventory. 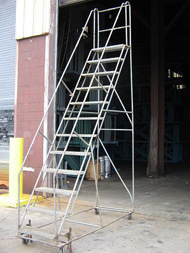 These newsletters provide the latest prices on a variety of items, such as pallet rack wire decking, teardrop, USP, and Interlake pallet rack styles, and an assortment of other material handling equipment that is guaranteed to help you store and move product more easily and efficiently. To learn more about the pallet racking systems available at The Surplus Warehouse, visit our Philadelphia facility or follow us on Facebook. Our inventory changes constantly, so stay informed and get the best deal at The Surplus Warehouse.